In the early seventeenth century, Cardinal Francesco Maria del Monte served as the unofficial Florentine cultural ambassador in Rome. He regularly entertained visiting dignitaries and represented the Medici family's interests within the Vatican. He was an avid art collector, glass enthusiast and amateur alchemist. He was a patron to the artist Caravaggio, to the astronomer Galileo and a dear friend to Neri's employer Don Antonio de' Medici. 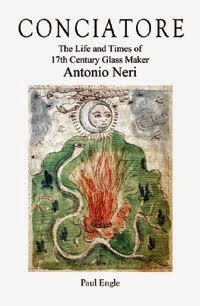 Del Monte collaborated with Niccolò Sisti, the grand duke's glass foundry master at Pisa, where Neri also worked for a time. Sisti often provided Del Monte with glassware for Medici customers within the College of Cardinals in Rome. 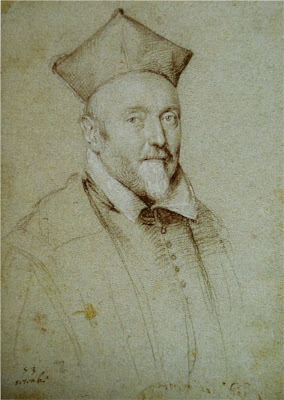 The cardinal's patronage also brought many glassmakers in Rome to the appreciation of the papal court. After his death, Del Monte's will shows that at his main residence, the Palazzo Madama, he maintained an entire room, "gabinetto dei vetri" [cabinet of glasswork] that housed five hundred pieces of glassware. It cannot go without mention that he was also the proud owner of what has become one of most celebrated pieces of ancient glass, now referred to as the Portland Vase. There are indications in Neri's 1600 manuscript that he visited Rome. If so, it is hard to imagine him not seeking an audience with the cardinal, either at his villa on the Pincio, overlooking the city or at the Palazzo Madama, now offices of the Italian Senate. The palazzo was appointed in fabulous luxury and arranged to accommodate a constant flow of dignitaries from around the world. The villa, on the other hand, was where the cardinal's alchemy laboratory was located. This was a more secluded retreat where the cardinal could entertain guests with more discretion. As the sixteenth century ended and a new one dawned, Del Monte sheltered the rough-and-tumble painter Michelangelo Caravaggio, whom he set up with an in-house studio and an allowance. 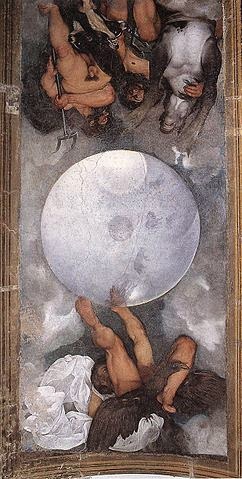 However, in 1606, the master of Realism fled Rome after reportedly murdering a tavern waiter over a tennis wager, but not before executing his only known fresco on the vaulted ceiling of Del Monte's own alchemy laboratory. Looking out over Rome, on the panoramic Pincio, in the Villa that later became the Casino Ludovisi and is now known as the Casino dell'Aurora, Caravaggio put his brush to work. The villa was a relatively secluded retreat where the Cardinal could entertain guests discretely, including his friend Galileo–Del Monte and his older brother Guidobaldo helped land Galileo the chair of mathematics at the university in Pisa. This is also where Galileo demonstrated his telescope for interested dignitaries in Rome. It would be interesting to hear the astronomer’s comments on Caravaggio's tribute to heliocentrism. *The material in this post first appeared in a different form on 27 Nov. 2013 and 4 Jul. 2014.